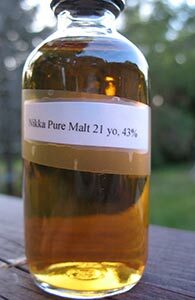 The Taketsuru “pure malts” from Nikka are, I believe, blended/vatted malt whiskies (i.e. no grain whisky in the mix) from some combination of Nikka’s malt distilleries. I’m not sure what the profiles or proportions of the components (presumably from Yoichi and Miyagikyou) are in any of them. This 21 yo is a much lauded whisky and recently arrived in the US (albeit at a rather steep price) and so I’m quite excited to be trying it. 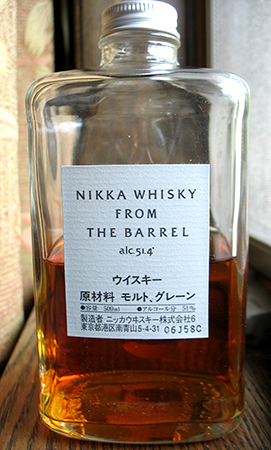 Nikka is one of two Japanese whisky producers currently in the US market (Suntory is the other). So far they’ve released the excellent Yoichi 15 and the Taketsuru 12 (a vatted malt which I do not know) and there’s word that one of their grain whiskies is on the way as well. Those who’ve had access to Japanese whisky from other markets are hoping that they will eventually add this blend to their portfolio here as well. Packaged at cask strength (or at high strength anyway) in a distinctive square bottle this whisky is sheer easy drinking pleasure, and some of the pleasure comes from the fact that it is a very good value (I paid $34 for the 500 ml bottle in the UK; I guess that would be $51 for a 750 ml bottle–so, maybe not quite as good a value once you do the arithmetic).